This post is sponsored by 3M. All opinions are my own and additional products used in the project were selected by me. 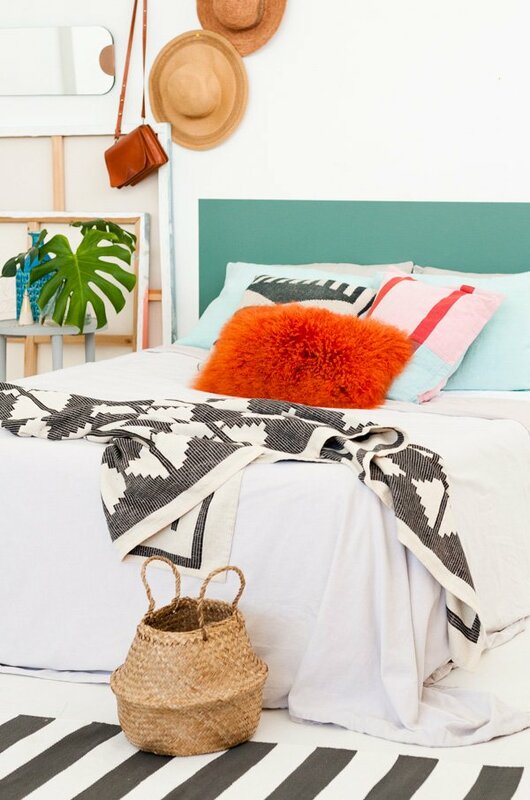 If you’re tight on space (or budget) for a bedroom makeover, today’s project is for you! 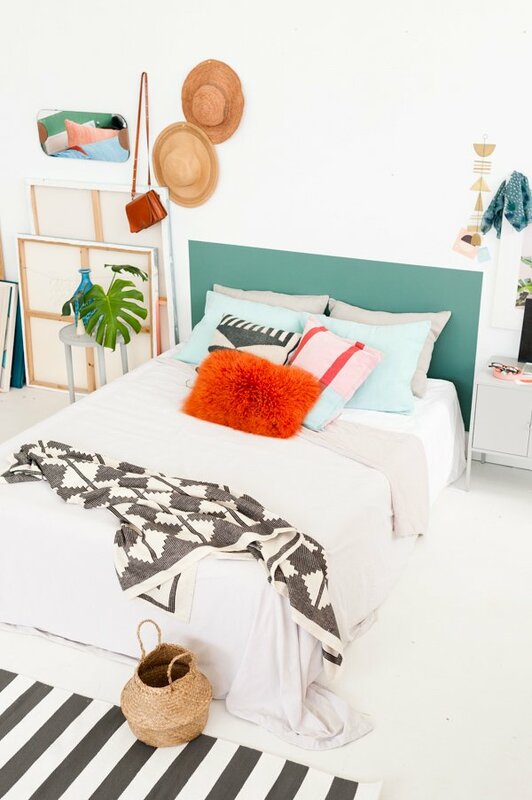 It’s one of my new faves because it’s super affordable, easy, and can totally transform a room…or at least your headboard! 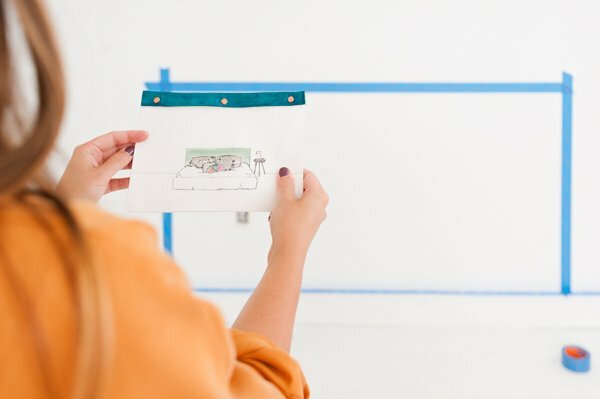 I teamed up with 3M and ScotchBlue™ Painter’s Tape to create this DIY painted headboard idea that you can endlessly customize to your own style / color preferences, the size of your bed, etc. And now I want to try this in literally every bedroom EVER! 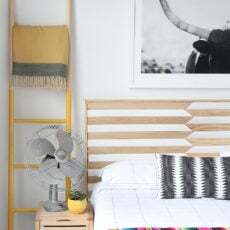 Click through for the video tutorial of this do it yourself headboard and all the before and after photos. 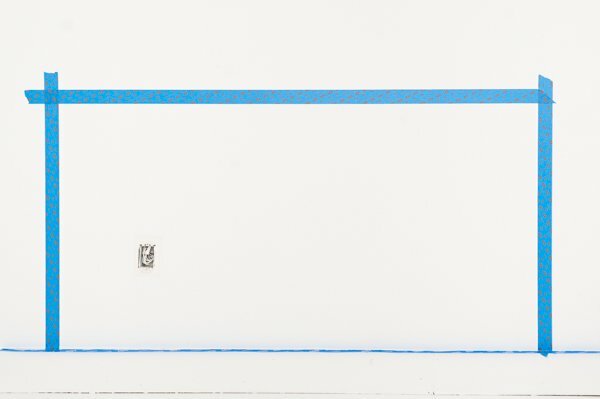 *You can find retail availability for ScotchBlue™ Painter’s Tape on ScotchBlue.com – I usually get mine through Amazon or Home Depot. 1. 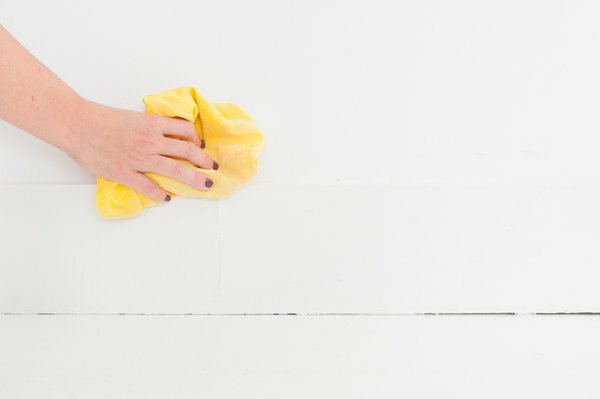 I always start by cleaning all baseboards and trim with a damp cloth to remove any dust / debris and prep the surface for the painter’s tape. Try to avoid using household cleaners as they can affect adhesion – sometimes I’ll use a spray bottle filled with plain water though. 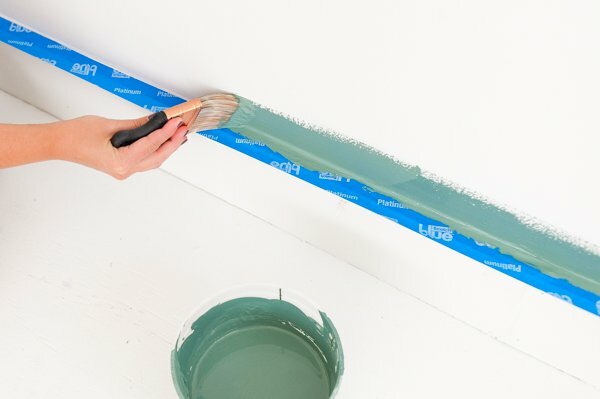 Wait for the surface to dry completely before taping. 2. Next, remove any outlet plates near the paint zone with a screwdriver and set aside. I say this every time, but it’s helpful.. I always throw screws and outlet plates into a bag, so I don’t lose anything. 3. Next, it’s time to tape! I used two kinds of tape for this project – one for the walls and one for the baseboards. I’ll explain which tape is best for each scenario, but you can also use the tape selector tool on ScotchBlue.com/tapeselector to figure out the type of tape you should use for your project. It takes less than 30 seconds – and I use it all the time to double check things. Baseboard tape. 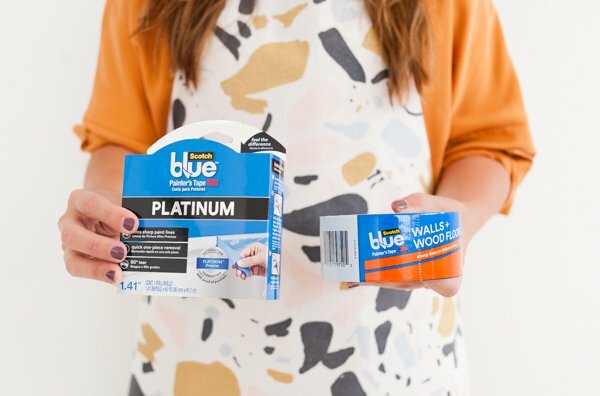 I used ScotchBlue™ PLATINUM Painter’s Tape for the baseboards of this project because it truly is my favorite painter’s tape. It removes in one piece with no slivering or tearing and I always get ultra-sharp paint lines with this tape. 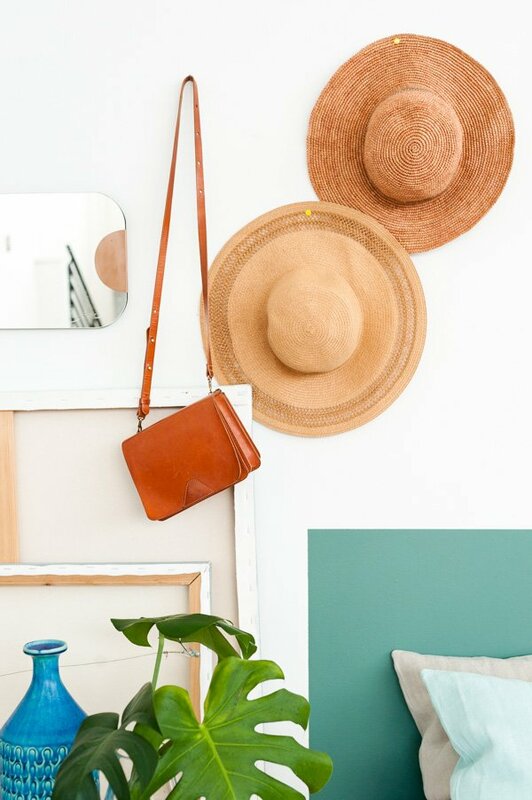 I used it for the color blocked mirror DIY, my apartment entryway makeover, and a whole bunch of others. 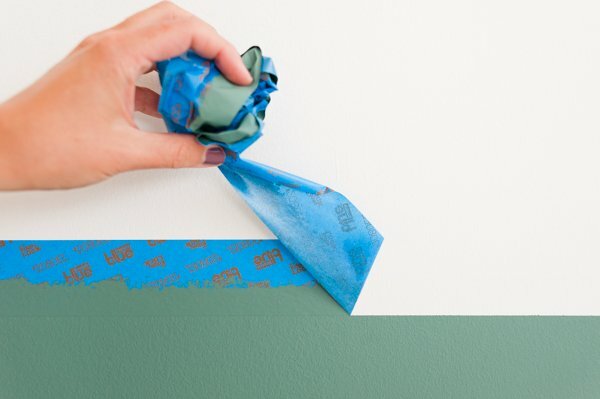 The poly-backing makes it easy to do 90 degree hand-tears and it works on a variety of smooth surfaces like baseboards, trim, metal and glass. 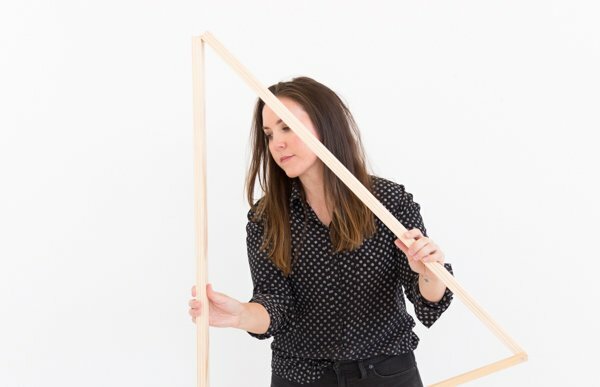 To apply the baseboard tape, get as close as you can to the wall and the baseboard joint and start rolling the tape out while running your fingers over it as you go. Once the tape has been applied to the surface, I like to go over the whole thing once more with my fingers to make sure it’s secure before moving on to paint. Wall tape. For creating the headboard shape, I used ScotchBlue™ WALLS + WOOD FLOORS Painter’s Tape. 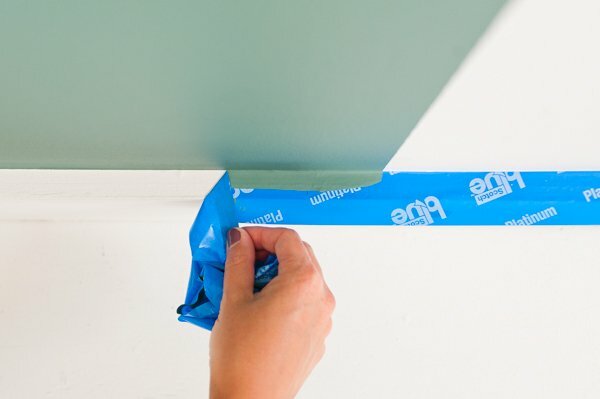 I use this painter’s tape anytime I’m taping directly onto the walls (or wood floors – basically any smooth, delicate or freshly painted surfaces that are at least 24 hours old). 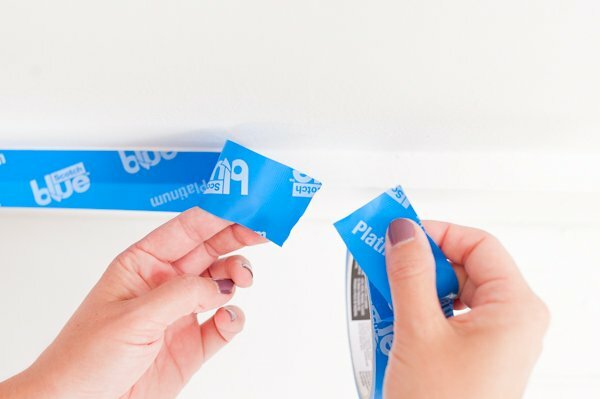 To apply this tape, you just roll it out while running your finger over the tape as you go, to make sure it was secure. Pretty simple! Just be sure to press down firmly over the tape’s surface with your fingers to make sure the tape is secure. And use a level (I just use the level app on my phone usually) to ensure the headboard lines created by the tape are level before painting. 4. For painting the headboard, I used a small paint roller (with a 3/8 nap for smooth surfaces) and a 2 inch brush for around the baseboards and the outlets. I did 2 coats of paint and it took less than half quart of paint to complete. Be sure to let the paint fully dry between coats. Recommended drying times will be on the can of paint. 5. Once the paint has completely dried, it’s time for the big reveal…of those ultra-sharp paint lines. We’re not quite done yet! For the baseboards, if necessary, score the edge (where the painted surface and the tape meet) with a sharp blade. Especially useful if your paint is super thick in any areas. Then, slowly remove the tape at a 45° angle and pull the tape back onto itself for best results. 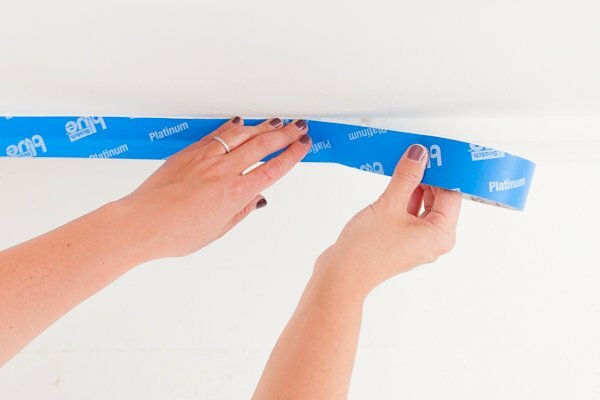 For the wall tape, skip the scoring step (you don’t want to damage the walls) and slowly remove the tape, again at a 45° angle – pulling the tape back onto itself for best results. You can see a demo of this in the video tutorial toward the top of this post, if you need a little guidance. 6. Screw wall outlet covers back on, if applicable, and you’re ready to set up your bed and decorate. How long did it take? Not including drying times, this do it yourself headboard project took about an hour to complete. So, it won’t take up your whole weekend. And it’s renter-friendly, since the surface that would need to be painted over at move out is relatively small! Bonus! 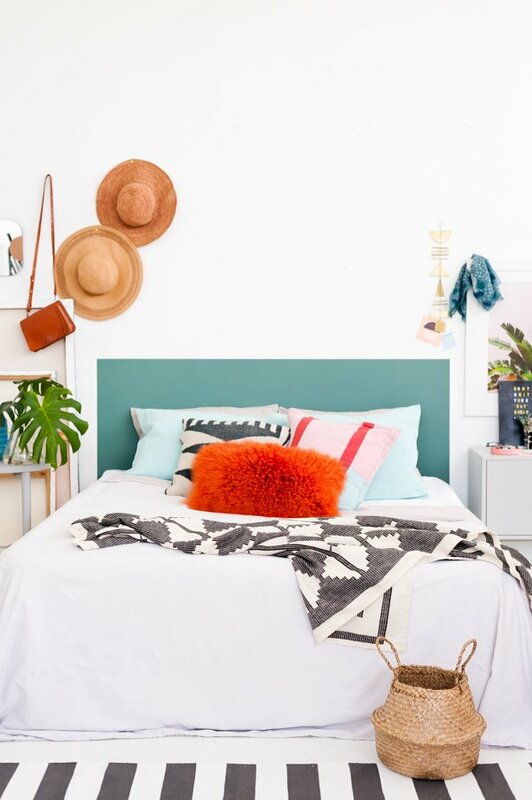 When you’re ready for a new look or a fresh start, you can easily paint over the headboard shape again in about the same amount of time. You can customize it to any size bed and bed frame – make it taller, shorter, wider, even create patterns with multiple paint colors, etc. What do you think of the finished headboard? 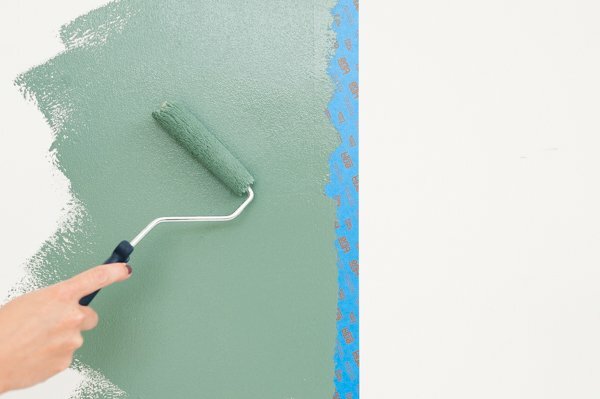 Would you try this DIY in your own home? And if so, what other paint color(s) do you think would be fun for this project? This post is in partnership with 3M. Thanks for supporting the brands that help keep Paper & Stitch running. The colour is so pretty. 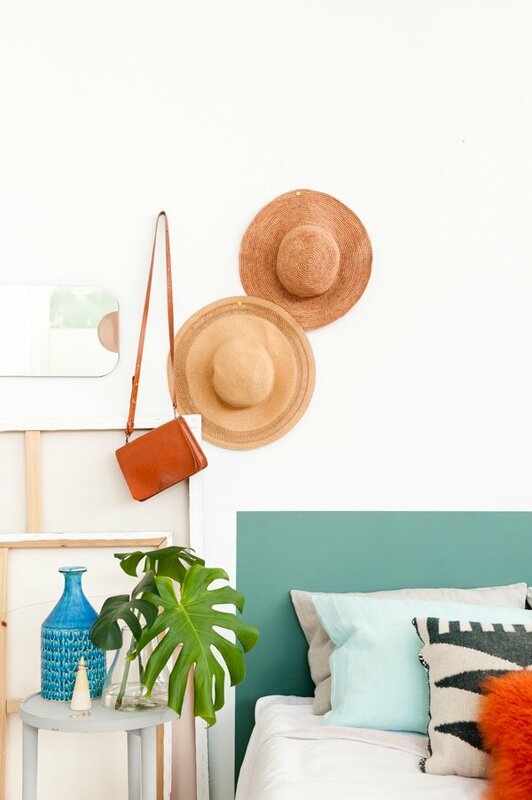 Where can I find the monstera leaves? Are they faux? Hi Antonella. They’re real. I got them at a local flower shop. This is great! I’m going to do a deep purple!! The color of royalty, right?!! I love this idea, and it’s so simple! Makes all the difference in the room. Love this!! What colour did you use? I have tried this idea. I made it wider and use multiple colors. It awesome. I love this creative idea. So believable! 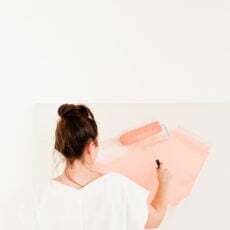 To add variations, thumbtacks could be spaced around the outer edge for an industrial touch, or faux painting effects could be used to suggest marble or wood materials. Buttons could be painted on after measuring, with a little shadowing around to suggest an upholstered headboard. These effects can be practiced first on paper to build confidence in painting on the wall. Love this!! Where are your throw pillows and black and white blanket from? They add such personality. 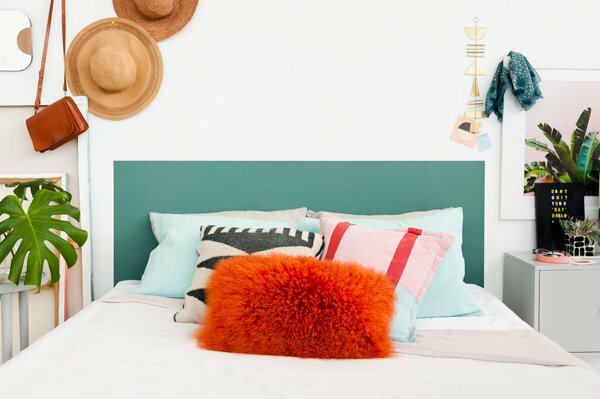 I saw this in good housekeeping in November and now I’ve been thinking about getting rid of my wobbly headboard in exchange for this great idea! Also, where is the cute throw blanket from? I love it!! !